De Panorama Head 360 ° by Mantona is perfect geschikt voor panoramafotografie. Hiermee kun je foto's maken tot 360 graden. Een schaalverdeling in stappen van 15 graden is mogelijk, wat een zeer precieze werking mogelijk maakt. The Panorama Head 360° by mantona is perfectly suited for panorama photography. With it, you can create shots up to 360 degrees. A graduation in 15 degree steps is possible, which allows very precise working. 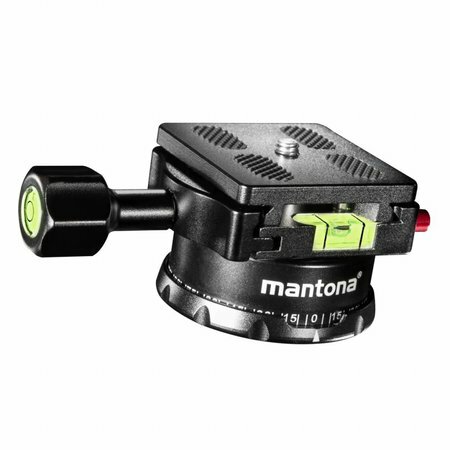 The mantona Panorama Head offers a high comfort of use and a well thought-out design. The built-in bubble level allows an exact leveling of the head, which makes very precise horizontal turning motions possible. The safety screws in the quick-release plate prevent the camera from accidentally coming undone from the panorama head. That way the risk of falling is minimized. The quick-release plate is rubberized and therefore offers a high frictional resistance. A twisting of the camera is prevented and an exact fixation and alignment is guaranteed. The locking screw is rubberized and therefore offers maximum grip. With the help of the locking / friction screw, the frictional resistance can be adjusted to your camera model. 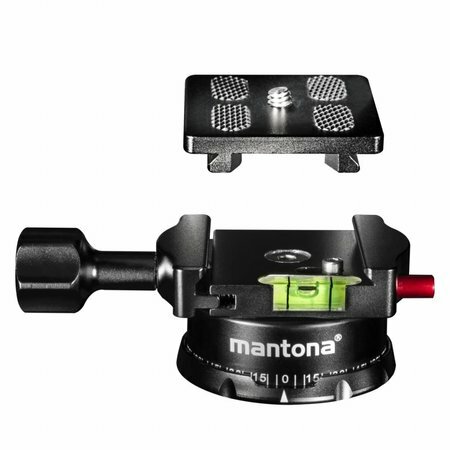 The panorama head is made from high-quality aluminum, which ensures a particularly high durability and little wear. It comes with a 1/4 inch and 3/8 inch tripod connection thread. Thanks to its very small size, transport size and weight of the head are very low and it fits into every photo bag.